Since 1960, the Gibson Hummingbird has been one of the most popular square shoulder dreadnought acoustic guitar designs, gracing the stage in the arms of musicians from all genres. Keith Richards (The Rolling Stones), Thom Yorke (Radiohead), Shuggie Otis, Gillian Welch, Eric Church and Sheryl Crow are just a few of the many singer/songwriters/performers who have let their songs take flight on the strings of a Hummingbird. 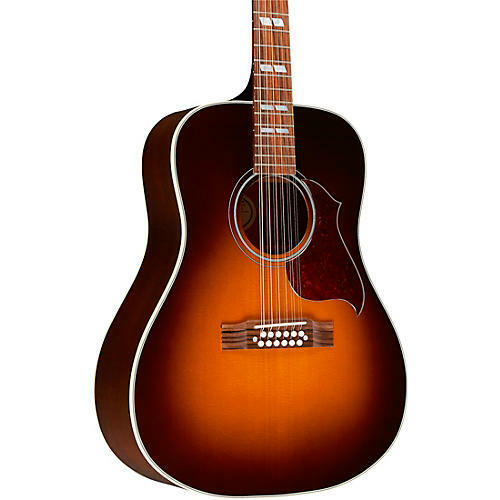 The first square-shoulder dreadnought Gibson ever produced, the Hummingbird has been celebrated over the years for its versatility, even with variants in tonewoods or the addition of a cutaway and electronics, beloved for its ability to handle the softest passage just as easily as holding its own in an electric set. Now you can enjoy the Hummingbird in a way that few have before, as a 12-string, with the Hummingbird Pro Limited-Edition 12-string acoustic/electric. available at Guitar Center in a limited run. Based on one of Gibson's top-selling variant designs, It's a more affordable, stripped-down version that retains the iconic look of its predecessors, but adds six more strings to broaden your sound. Aesthetically, its warm, Nitro-Lacquer Vintage Sunburst finish is complemented by multi-ply top binding, and an understated Hummingbird Artist pickguard, while mother-of-pearl parallelogram inlays accent the fingerboard. Handmade by the luthiers in Gibson’s Bozeman, MT acoustic facility, the Hummingbird Pro Limited-Edition 12-String acoustic/electric features a superior dovetail neck to body joint and the tried-and-true tonewood pairing of a solid Sitka spruce top and solid mahogany body. Add to that special wide X bracing, a mahogany neck with rosewood fingerboard, a rosewood bridge and bone nut, and you get outstanding dynamic range with a supreme balance of lows, mid and highs far above and beyond standard 12-strings. It's also equipped with chrome Grover Mini Rotomatics with a 14-to-1 gear ratio to make tuning a breeze. Making this great all-around guitar an even smarter choice for gigging musicians, Gibson added an L.R. Baggs Element VTC pickup system, which features an undersaddle transducer to deliver the full-bodied, lively sound and excellent dynamics as you play. Its discrete soundhole controls allow you to easily adjust the volume and tone for the right flavor to suit your style. L.R. Baggs is one of the most trusted names in acoustic pickup technology, so you can play with confidence, knowing you'll get reliable, accurate performance from this pickup system.